This chapter discusses contemporary global challenges facing veterinary educators and summarizes some of the economic, social, political, and technological pressures underlying curricular and pedagogical change initiatives. 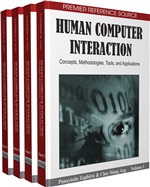 Integrating human computer interaction (HCI) into veterinary medicine curricula, as a strategy for implementing pedagogical transformation, is reviewed. Computer- assisted learning (CAL) projects recently developed at a veterinary college are described. Results of studies evaluating the effectiveness of CAL approaches to HCI integration within the veterinary medicine curricula are reported. Future research directions are proposed.